Introduced in Photoshop CS, Layer comps are a great way to create and save multiple variations of a document without having multiple files. Layer comps is a virutally unknown feature to many Photoshop users; I only started learning about this featuring and using it to save myself time in the past few months. I now wish I had started using them long ago. Layer Comps are a bit like "snapshots" of the Layers palette. It records the stacking order and visibility of each layer, as well as the layer styles and the position of the content of each layer in the image. It's not like the snapshot feature in the History palette since Layer Comps are actually preserved when you save your document and reopen it afterwards. You can create as many as you like, without substantially expanding your file size. You can recall a Layer Comp with an instant click. You can also export all variations to a multiple files or a single PDF presentation to send to a client to review, for example. Let's say you have created an amazing mockup for a new website layout or simply created multiple versions of the same photo and would like to quickly switch back and forth between the different versions without having to turn a bunch of different layers on and off. 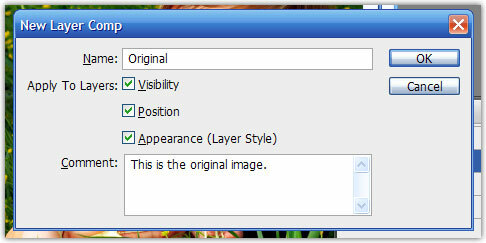 In these situations, for example, Layer comps can prove be a valuable tool. 1. Go ahead an open up an image that you would like to save multiple versions of. 2. Next open up the Layers Comp palette. If it is not already open, go to Window > Layer Comp. Before you begin to make multple variations/versions of the file, go ahead and create a new layer composition to easily view the original or go back to the original if needed. 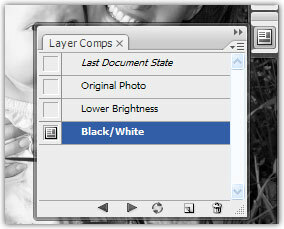 To create a new layer comp, click on the Create New Layer comp button at the bottom of this window; name it appropriately. When creating a new layer comp you will notice a few checkboxes asking what items you would like to save. It provides options to remember the visibility of all layers, the position of items on layers, and the layer styles (blending options) of all layers. To ensure that you make a complete "snapshot", you should check all three items. You may also find it helpful to go ahead and type a brief comment or description for each layer comp. 3. Next go ahead and make the desired changes to the document and create a new layer composition for each result. For my image I created a version after changing the levels and another after changing my image to a black and white image. After creating each composition, you can switch back and forth simply by clicking on the visibility icon in front of the desired composition. 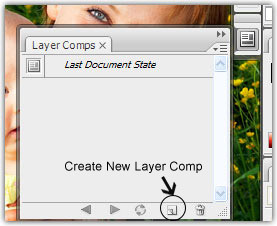 Learn how to export layer comps to individual files or a PDF presentation by going to page 2. Check out these brilliant photo manipulation tutorials.